Children’s Hospital at Erlanger is collecting Christmas trees to decorate the rooms of young patients. These small, decorated trees will add a little brightness during difficult times for kids and their families. Child Life Specialists will deliver the trees to the kids’ rooms. When the child or teenager is discharged, he or she may take their tree home! Trees must be 3 feet tall or smaller. Trees can be purchased under $20 at WalMart and other stores. Trees must be artificial. No live trees, please. Pick a theme for a child or teenager, and purchase or make ornaments. Toys, such as dolls and cars, may be wired on to the tree. Please do not include any food items on the tree. Please tie or wire ornaments onto the tree. No loose items please. Please be sure that the tree and ornaments do not include glass, sharp objects, or anything that could be a choking hazard. Lights are great! But battery-powered lights are best. Drop off the decorated tree on either Thursday, December 13 or Friday, December 14 from 8AM – 4PM at the Believe table in the Erlanger Medical Mall near the A elevators. 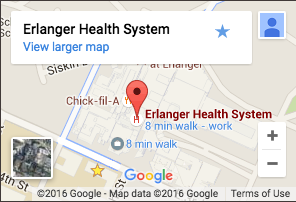 For more information, please call Emilia Jones at 423-778-7892 or e-mail emilia.jones@erlanger.org.